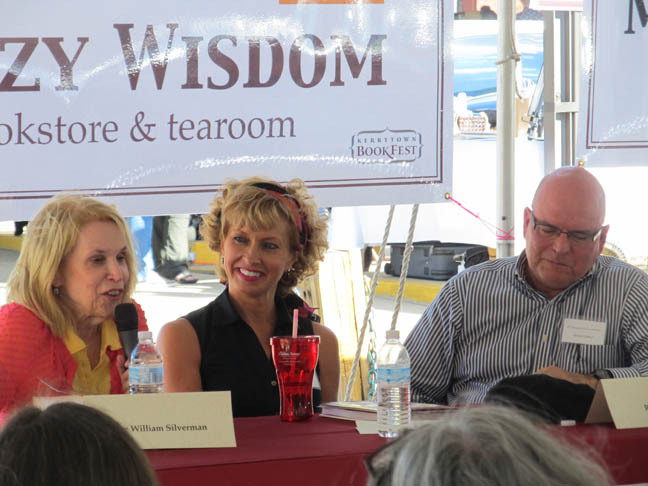 At three book festivals this year—the Ohioana Book Conference in Columbus, the Kerrytown Book Festival in Ann Arbor, and most recently Books by the Banks in Cincinnati—I learned an author needs an elevator pitch. I already knew this. I had an elevator speech, which I’d used on editors and agents. But the learning curve applies: competency plunges at first in new circumstances. I hadn’t faced prospective readers as an author. So I screwed up and had to re-learn what I knew. Lessons so basic and obvious that they’re mentioned by anyone with a nodding acquaintance with authorial self-promotion. You need a few crisp phrases. People will ask you what your book is about. “It’s about the ten years my family and I lived on a sheep farm in Appalachia,” I’d say. Thus I learned that farming isn’t a sure-fire sales pitch. No one knows anymore what you mean by that, if anyone ever did. Farming’s become, at best, exotic. At worst it is associated with abuses like erosion, toxic chemicals, and animal cruelty. People are confused—too many labels flying around—and their eyes dim as they try to slot you. Hard-fisted agribusinessman, crunchy homesteader, one of Joel Salatin’s better-than-organic grass-based acolytes? Pray tell? No, on second thought, don’t. People wonder what you’re going to inflict on them under this rubric. Are you writing about livestock that really were pets—mooning over them and boring my ears off? Or does this story involve animal deaths—because, forget it, I like warm and fuzzy, not bloody—don’t we have enough trauma to deal with as it is? Fair. Fair enough. So I learned to quickly add the mantra I used in my last year of revision: “It’s a story about dreams, loss, fatherhood, and farming.” I might have said place, too, but maybe farming gets that. Several women told me my book is a love letter to my wife. True. But that hardly seems an adequate pitch. I love my wife! Buy my book! A reader recently told me my book is really about healing. That sounded great to me—and accurate to the extent that the narrative succeeds in showing me grapple with my family’s farming legacy. I tried adding healing to my thematic phrase, but that seemed a word too far. Since three is a magic number, I don’t know why my four-part tag seems to work, but it does. Then again, in some ways maybe a writer is the last person to know his own book. He tried certain things. But if it soars for a reader, maybe it’s greater than the sum of its consciously intended parts. At my first book show, it also became clear I needed something to give out with the book’s name on it. (And when I worked in publishing I oversaw book campaigns.) Not everyone wants to buy right there. Maybe they want to ask their librarian to order it. Or they want to think about it—or get the e-version. So I ordered postcards and then bookmarks. Bingo. People love free stuff. And it’s true: you’ve got to cast some bread on the waters. Personally I love physical bookmarks, though they seem only slightly more popular than the postcards—which can be used as bookmarks, after all. 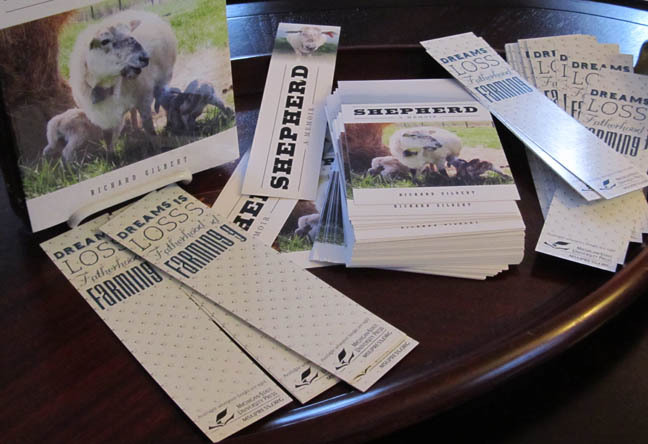 Now, as potential readers’ eyes sweep the stacked copies of Shepherd: A Memoir, maybe sizing up the free goodies too, my elevator pitch holds the cautiously curious for a beat longer. And a “crowd” at your table, which means two or more people—though even one helps—attracts others. The people I’ve talked to in these quick, intense booth exchanges blur. But I’m sort of haunted by the look one man gave me at a book-related event. Unlike booth visitors, he’d already read my book. 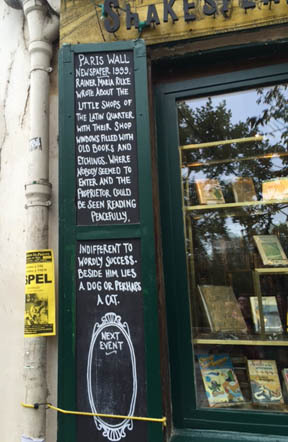 The other day, as I read an amusing blog post at Creative Shadows about Jen Campbell’s Weird Things Customers Say in Bookstores, I recalled him. It might have been funny. Except he shook his head sharply as he spoke, his face darkened with disapproval: anger’s kissing cousin. And then his severe countenance lifted, his mood reset as if with a brisk clap of the hands. We were left to soldier on as best we could in each other’s company—we got on fine. But I’d disappointed him—by not looking like my paper portrayal—and I felt like fraud. I’d flunked as a character in my own memoir! Maybe I hadn’t described myself accurately. I weigh a tad more than the Richard Gilbert depicted in Shepherd. I may still think of myself as a little slip of a thing, but I started growing once I sat down to write and we moved off the farm. And I was even lighter in the loafers in the late 1990s when our story opens. Yet doesn’t the creator (writer, teacher, thinker, baker—parent?—entrepreneur, musician, painter) usually fall short of the image we’ve created reflexively from the artifact? A thinner if not better me, his struggling self refined in the fires of poetry and desire, wrote that book. While I esteem art and its creators, a wiser part of me suspects that any worthy role offers, to the fully committed, the transcendence for which the human soul hungers. Delightful and insightful as always, Richard. I’ve been hoping for some blog posts about your post-publication adventures. The exchange with the disappointed reader was classic. Readers are like students. They really pay attention to the body and to any image that messes with their created mental image. Love your four words as an elevator speech. Sometimes the nouns are better than a sentence. Thanks, Shirley. Great comment about readers. By now you must have met quite a few. It would be interesting to see their images projected . . .
Hi, Richard. Thanks for the post notice. Your exchange with Shirley is spot-on in this sense in particular: readers often internalize the “I” voice writing, especially if they are in sympathy with it, to the extent that they feel the writer must look or feel something like them themselves. When a writer doesn’t either look like them or like what their idealized self-projection is, they feel cheated. There’s a reason why I’ve left my gravatar image blank for so many years (he!he!). You are indeed . . . the shadow operator. And your wisdom grows apace! Love your revised pitch, btw. And, I think you look fabulous. I would’ve paid cash money to see your faux paus, Darrelyn—thank goodness it was with Dinty! Richard, some years ago when I met a cousin of Dot’s who had read Getting There from Here, she greeted me with, “You aren’t nearly as impressive as your book.” OK, then. Same experience! It’s once of those accidental (one hopes) insults that you don’t forget but that I think you experience almost immediately as emblematic. I wonder if it afflicts writers more than painters, though. Love your booth bling, Richard! Thanks, Sarah. If I were more with it, I’d have sheep-shaped cookies to give out too . . .